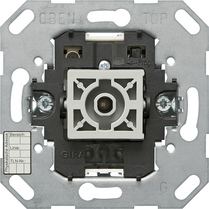 The 1-gang rockers of the flush-mounted design lines can be inserted on the bus coupler button, 1-gang with two-point operation (upright rocker). The bus coupler button, 1-gang with two-point operation can be used to realise the functions switching (pressing), blind, dimming with stop telegram and dimming with cyclical transmission. LED display for: permanent-on or permanent-off or status, rocker up or status, rocker down or status LED invertible (orientation light).